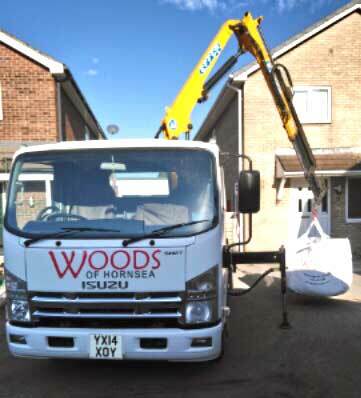 The high-quality decorative aggregates from Woods of Hornsea can brighten up your garden and give your property a new look. Whether you are going for a contemporary scheme or want to refresh a dull area of your garden, we supply aggregates in a range of colours and textures. We undertake small and large orders and cater to trade and private individuals alike. Aggregates can be supplied in small bags, 1/2 tonne scoop bags, 1 tonne builder's bags or tipped. We provide a crane off load service to get your materials where you want them. Designed for driveways and landscape features, this high-strength and extremely durable crushed granite will transform the look of any property. Once laid, this natural product should require little or no maintenance. This deep green granite originates from North Wales and has a speckled effect. Good for paths, ground cover and driveways. Can transform any landscape scheme. This is one of the most popular products in the decorative Aggregates range. As the name suggests, it has a deep golden colour and is excellent for paths and driveways. Its angular feature makes it ideal for both decorative and practical purposes. Yorkshire cream is a beautiful decorative aggregate, perfect for driveways, paths, walkways and borders. Its distinctive cream, beige colour makes this a popular choice for all jobs. It has been a best seller on our range for a number of years. Whatever the job, it's always easier with the right tools. Check out our selection of small plant for hire. We also stock a wide range of hand and power tools for professional and DIY use. Silver grey in colour when dry, this top of the range decorative aggregate looks stunning when wet. A hard angular material used on mainly footpaths, patio edging and oriental gardens, this product will give you a modern yet contemporary look. A cost-effective and versatile decorative aggregate, limestone chippings are ideal for large ground cover, drives and pathways. They are also a popular choice for all gardening projects. This durable product will give you an understated, yet quality result. A mixture of three colours; red, black and white, multimix offers a strikingly colourful option. Long-lasting and easy to look after, it offers a bold choice for gardens, landscapes and water features. Flamingo is an attractive stone well suited to any garden project. A mix of pink, white and grey, its subtle colouring proves popular for ornamental uses, especially borders and rockeries. Feel Free to Ask one of our experts. Ask in store, by phone to 01964 534664 or fill out our contact form. Sourced locally, white gravel is not only at the lower end of the price range, it can be used for a number of applications. It offers you another option to add natural colour to a variety of settings. A white marble effect product which can be used where sharp contrast against other decorative is required. Originating from Spain, this quality product gives a classical finish to all landscaping projects. Attractive, highly decorative gravel, light blue in colour, the ice blue is available in 20mm size. Recommended for a variety of projects, it provides a dramatic effect to paths, borders, rockeries, tubs, water features and driveways. Designed for driveways and paths, this hardwearing granite is very popular. With its greenish black colouring, it gives a slightly different option to the other granites in the Decorative Aggregates range. Have You Got The Right Safety Wear? Our range includes: Safety Boots, Gloves, Eyewear, helmets, respiators, jackets, trouser and hats. Don't become a statistic - WORK SAFELY. Our range of cobbles and pebbles will provide a decorative shape and structure to any landscaping project. Woods pebbles can be combined with aggregates to give a decorative presence to rockeries, borders and flowerbeds. Our range of cobbles and pebbles will provide a decorative shape and structure to all landscaping projects. You can combine them with aggregates to give a decorative presence to rockeries, borders and flowerbeds. Scottish pebbles are decorative stones that can complement a variety of projects. This is a stunning naturally-rounded garden aggregate giving a riverbed, beach or cobbled look to any area. These decorative stones will complement a variety of projects. A stunning naturally-rounded garden aggregate, this product can give a riverbed, beach or cobbled look to any area. Our local delivery service provides a quick and easy way to get materials to your home or site. We also offer a Nationwide service on many products including bricks and blocks. Ask for details! Garden slates can be used in innovative ways to add colour to your outdoor space. From covering bare soil to forming borders for flower beds, granite slate chippings are versatile and offer an excellent alternative to gravel. At Woods of Hornsea, we supply decorative slate for small and large orders and cater to trade and private individuals alike. Our blue slate is amongst the most popular and versatile product in our decorative range. Ideal for any gardening or landscaped project, its durability and unique natural beauty make it attractive for pathways, large pots and water features. Chunkier than blue or plum slate, the green slate provides superb coverage for paths, borders and all ground cover. A fabulous product with natural plum tones, this variety of slate is used to transform any garden path, borders, tree bases and water features. Bagged deliveries can make your project much easier, especially for smaller quantities.